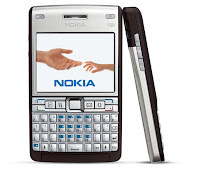 Nokia E61i is got your 'point of view'. Benefit from the improved email experience with dedicated email keys, Nvi key, large screen, and QWERTY keyboard. View and edit attachments easily on the device. Enjoy fast connections via 3G and explore the full potensial of mobile browsing. Experience the new and improved design. Enjoy your favorite tunes on the MP3 player and capture images and videos with the 2 megapixel camera.